SilverTowne, LP, is located in Winchester, Indiana, and was founded in 1949. They are considered one of the largest and most well-respected precious metal dealers and private mints in the United States. Leon and Ruhama Hendrickson created SilverTowne on the premise of honesty and integrity, and with the belief system that a deal could be sealed with a handshake; they based their company on the trustworthiness of good business practices. The company has grown from a handful of coins to four different entities under one roof. SilverTowne mints highly sought after “logo” silver bars for investment purposes, as well as intricate art bars which offer more of a collectibility factor. SilverTowne’s distinctive logo and markings are recognized by investors and collectors alike, which allows for easy buying and selling of their silver bullion and other products. SilverTowne mints gorgeous silver bars, many that can be custom engraved for gift giving for a small fee. Some of their silver bar products are hand-painted by talented artists and covered with enamel including designs for Christmas, religious events, special occasions, other holidays, and more. The most popular SilverTowne silver bar are their Prospector bars that come in 1 oz., 5 oz., and 10 oz. sizes (pictured above). Each bar carries the logo of a prospector and his faithful mule. 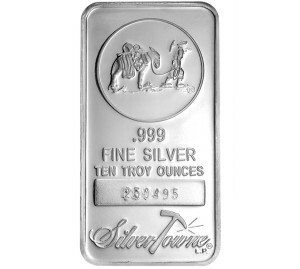 These silver bars have individual serial numbers to assure that all SilverTowne silver bars are absolutely .999 pure silver and carry the SilverTowne hallmark. The SilverTowne 10 oz silver bar is the most popular for both investors and collectors, but SilverTowne has many other sizes and even silver bullion loafs that come in different weights. The more collectable silver bars sell at a higher premium over the spot price of silver at the time of purchase. Unfortunately, SilverTowne as of late has struggled to produce enough of their products to satisfy market demand. Their 10 oz logo bars especially have seen massive delays and shortages in 2013, which is largely due to SilverTowne’s limited production ability. We hope to see them increase their capacities in the near future. By signing up for their email newsletter, a subscriber is automatically entered into the contest. There are no gimmicks or requirements and no purchase is needed. It’s a generous offer for a well-respected company and shows the dedication to their industry and excellent customer service. Purchasing silver bullion and other products from SilverTowne is easy and they ensure 100% satisfaction. Customers can return their purchases for a refund after 10 days. There are some restrictions clearly outlined on their website, but this is a policy that most retailers do not offer.